Many of us like to think that we're honest, upstanding individuals and that it's a minority of society that actually lowers itself to lying and cheating. But researchers are finding that, actually, we're not as virtuous as we think—and we all lie a little to make things swing in our favor. Along with other experiments, his work suggests that only a very small number of people—the real rotten apples of society that we tend to fixate on—lie at a high level. But virtually everybody—yes, even you—fibs a little here, a little there. We claim higher losses on insurance claims, overestimate our billable working hours, and make other small but sneaky claims to maximise our gains. It's engrained in human nature to say things that result in positive outcomes, even if they're not entirely true. 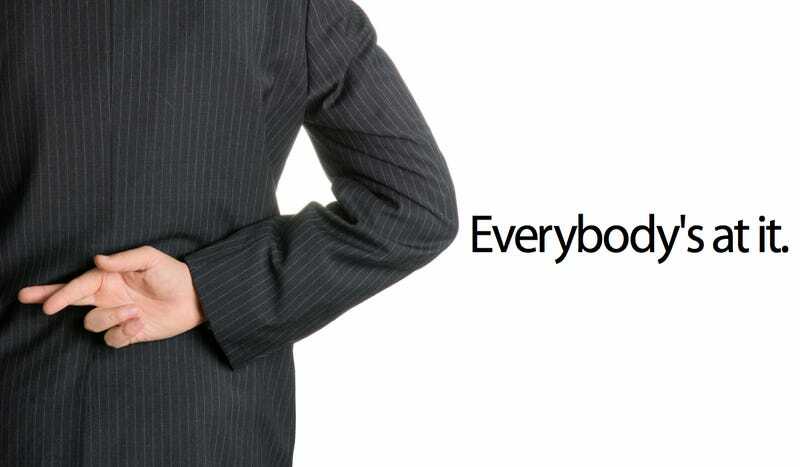 How can we stop people from lying? In fact, that's exactly what Ariely is working on now. He's found that reinforcing moral codes—like the ten commandments—while people undertake tasks reduces the amount of lying that goes on.